You have certainly encountered the denominations American roulette, European roulette, French roulette or Roulette without Zero. Even if you don't know their essence, you can sense a difference between these roulette types. For those initiated into the roulette mystery, every little detail counts. Furthermore, the experts say that it is a huge difference between the game played in grand casinos located in Vegas or Monaco, for example, and the one played on the Internet. Those who love to travel to these casino destinations, just to feel the live suspense, no online format of the game is as satisfying as the excited crowd of players gathered around the roulette table. For others, it is more convenient to experience the thrill of the game from the comfort of their home. They are grateful to the software industry from around 1995, which lanced the online version of the roulette. Nowadays, it seems that the number of the online players exceeds that of the live casino fans. It is a plus in favor of the online game the fact that it is available from all the corners of the world, due to the Internet. 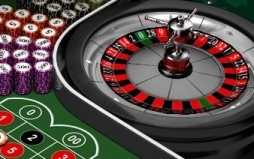 If a beginner wants to try the roulette, it is important for him/ her to get familiar with both the American and European versions of the game. On the American wheel, the slots are in number of thirty eight: one to thirty six, 0 and 00. You can bet on these numbers taken individually, or on a set of numbers. The players make the wagers and the croupier starts spinning the wheel. Consequently, the ball hits one of the slots. Except for the casinos from Atlantic City, all roulette winning rules and payoffs are defined by the States. Payouts are determined on a "for 1" basis. On all wagers the house advantage is one to nineteen or five point twenty six percent. For the zero- double zero- one-two-three combination, the edge amounts to seven point eighty nine percent. These numbers and rules may seem a little bit complicated at first glance, but the play will bring the expertise. According to many of the roulette players, the European game version is more exciting than the American one, due to its specific features. One of them would be the experience of the "prison". The rule of the prison is to play on a single roulette wheel. The bet has to be made on even sum. That means the wager is on the odd, the red/black, on the even, or on number sets like one to eighteen or nineteen to thirty six. If the ball lands on 0, the players can opt between getting half the wager back and being put in "prison". In case the bet put in "prison" wins, it is given back to the player, without other winning.